First Released COMIC-CON INTERNATIONAL: SAN DIEGO 2016 Exclusive Collectors Set Numbered Products released at San Diego Comic Con always become the most valuable collectors figures. Limited quantity not to be repeated.First Doctor - The Web Planet For the first Doctor I did a new version of the costume in golden/sepia tones. The guiding principal for the whole set was to use more natural tones and not make the figures so high contrast. There is almost no black anywhere in the set - very dark brown, very dark blue, loads of washes and shades of grey. There just aren't a wealth of colour pictures of the first Doctor so the colour palette was arrived at tonally. Second Doctor - The Two Doctors Bluish grey shirt, greenish grey tartan trousers and yes, grey hair. Third Doctor - The Time Monster Beautiful russet red jacket with fleur de lis, deep brown trouser lighter hair. (I actually think this costume is more accurate to The Three Doctors - he didn't wear the bow tie in the Time Monster) Fourth Doctor - Logopolis This is a more 'as seen on screen' version of the S18 costume, the red in scarf is less orange, the burgundy a deeper shade, the shirt is a bone white, not a pure white. Fifth Doctor - The Awakening All new treatment of the costume. Grubbier shoes, not so bright. Sixth Doctor - Real Time The fourteen-shades-of-blue version of his costume as seen on Big Finish covers. Seventh Doctor - Ghost Light All new treatment of the tartan trousers. Eighth Doctor - Night of the Doctor Post crash bloodied face and dirty outfit. War Doctor -Day of the Doctor Revised darker version of the costume. Gaiters are more like greenish canvas now. Other colours tweaked. Darker grey in the beard. Ninth Doctor - The Parting of the Ways Dark purple t-shirt. Trousers dark grey, not black, shoes dark brown not black. Tenth Doctor - The Shakespeare Code All colours re-interpreted. Grubbier shoes, darker coat different blue for the pinstripes. 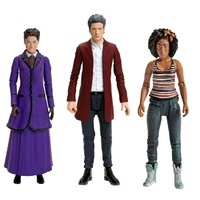 (looks to be the newer head sculpt also) Eleventh Doctor - The Beast Below All new colour treatment, new base tone for the tweed with a new wash over it. Shoes show wear on the toes, grey not black trousers. New interpretation of the grey shirt with the red striped pattern. Twelfth Doctor - Time Heist Very dark blue shirt. Another cool collectable brought to you by WhoCentral.Sydney. 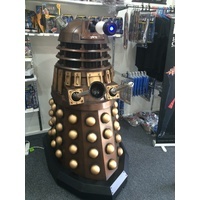 Sydney's only and most comprehensive Doctor Who store. Help other Who Central Sydney users shop smarter by writing reviews for products you have purchased.